The Hellenistic armies is the term applied to the armies of the successor kingdoms, which emerged after the death of Alexander the Great. 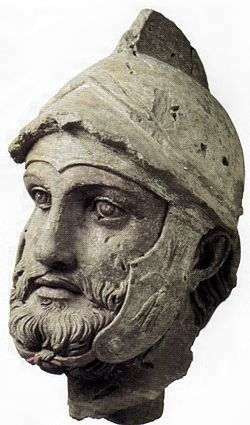 After his death, Alexander's huge empire was torn between his successors, the Diadochi (Greek: Διάδοχοι). During the Wars of the Diadochi, the Macedonian army, as developed by Alexander and Philip II, gradually adopted new units and tactics, further developing Macedonian warfare. The armies of the Diadochi bear few differences from that of Alexander, but during the era of the Epigonoi (Ἐπίγονοι, "Successors"), the differences were obvious, favoring numbers over quality and weight over maneuverability. The limited availability of Greek conscripts in the east led to an increasing dependence on mercenary forces, whereas in the west, Hellenistic armies were continuously involved in wars, which soon exhausted local manpower, paving the way for Roman supremacy. The major Hellenistic states were the Seleucid Empire, Ptolemaic Egypt and the Antigonid kingdom (Macedonia). Smaller states included: Attalid Pergamum, Pontus, Epirus, the Achaean League, the Aetolian League, Syracuse, and other states (like Athens, Sparta etc.). The Diadochi were capable of deploying some of the largest armies of their day, and could easily outmatch the numerical strength of either Phillip II or Alexander's Macedonian full strength contingents. However, the size of the armies participating in different campaigns could vary extremely, from a few thousand to over 70.000. Of these armies, outside Greece, only a fraction would have been of Greek origin, the rest being allied contingents and conscripts from the local population. The great losses affected Philip V of Macedon greatly, especially after his defeat at Cynoscephalae in 197 BC. With such a small population, and such drastic losses in battle, the Antigonid king had to think radically as to how to improve his states performance in the next war. In between the Second and Third Macedonian Wars, Philip V embarked on a major reform and re-organization of the kingdom. Expansion could secure 'the great reservoir of available man-power' that lay north in Thrace. Philip then transported segments of the populations of the coastal cities to the northern frontiers and moved those Thracians south. This, combined with economic and political moves, re-built Macedonia and allowed for Perseus, Philip's successor, to be in a stronger position. Perseus had enough grain to last the army ten years (without drawing on harvests), enough money to hire 10,000 mercenaries for ten years, and field an army of 43,000 men, a significant improvement compared to the situation of Philip V at Cynoscephalae in 197 BC, who fielded an army of 25,500 men. The eastern kingdoms, for example the Ptolemaic, Seleucid, Graeco-Bactrian and Indo Greek kingdoms, had an even more problematic situation. The basis of their militaries relied on Macedonians and Greeks, which were obviously not common to the areas that they ruled over. In order to overcome this, these kingdoms set up military colonies, known as Klerouchoi, to settle mercenaries and others from Macedon and Greece. The system would allow for the colonists to be given a plot of land and in return they would provide military service when needed. In Ptolemaic Egypt, for example, soldiers and officers were given lots 'in exchange for military service, whenever needed'. W.W. Tarn even suggests that the Greek (known to the Indians as 'Yavanas') population in India may not have been as small as one would suppose, stating 'there may well have been many more Yavanas...than we should suppose; we may have to reckon with a considerable number of men, adventurers or mercenaries from the west'. Historians and students of the field alike have often compared the Hellenistic-era phalanx with the Roman legion, in an attempt to ascertain which of the formations was truly better. Detractors of the former point out that in many engagements between the two (such as at Pydna and Cynosephalae), the legion was the clear victor, and hence represented a superior system. Opposing schools of thought, however, point to the Pyrrhic and Hannibalic victories as evidence to the contrary. Finally, one might note that these were not conflicts that solely featured Republican Roman Legionaries engaged against Hellenistic phalangites. 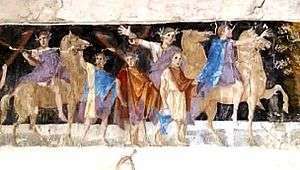 The Roman victories of Magnesia, Cynoscephalae and Pydna were won by armies that included thousands of non-Roman (often Hellenic) cavalry, elephants, as well as assorted heavy and light infantry. Such a comparison was also attempted in the ancient days, as is attested by Polybius' own effort to explain why the Macedonian sarissa was eventually conquered by the Roman gladius, but in the end, we should acknowledge that such a juxtaposition can be misleading, since both infantry formations had clear advantages and disadvantages that were historically oftentimes exploited. 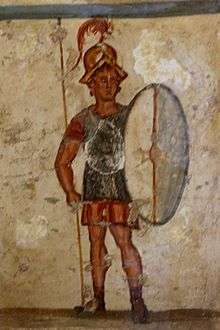 It was customary for the Hellenistic warlords to name individual units of phalangites according to the color of their shields. Thus, the phalanx of the Hellenistic armies used terms such as Chrysaspides ('gold-shields'), Chalkaspides ('bronze-shields') and Leukaspides ('white-shields') to denote formations within their phalanxes, the two latter being important in the composition of the Antigonid phalanx. 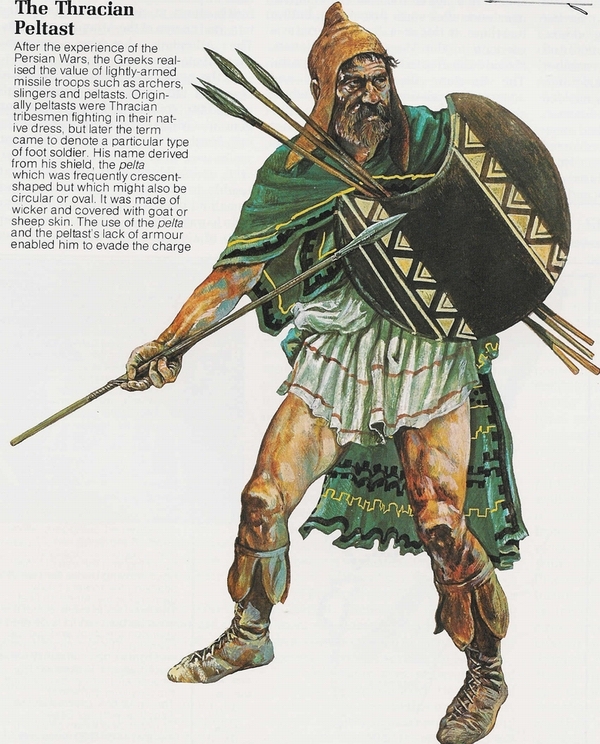 Antigonus Doson armed the citizens of Megalopolis as Bronze Shields for the Sellasia campaign in 222 BC. These units are mentioned by classical writers when describing the Antigonid army in battle. Although these units most probably ceased to exist after the battle of Pydna in 168, as the Antigonid kingdom had been crushed by Rome. These names were not only limited to the Antigonid (or Achaean) phalanx though. Plutarch tells us of Mithridates VI of Pontus, "The Great", having a corps of 'Chalkaspides' against Sulla at Chaeroneia. 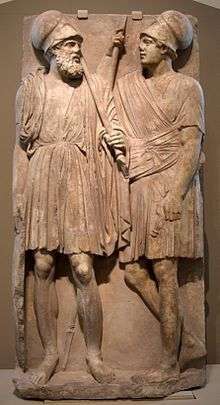 The majority of the Seleucid phalanx was probably formed by the two corps that are mentioned in the Daphne Parade of 166 BC, namely the 10,000 Chrysaspides and the 5,000 Chalkaspides. Little else is known specifically about them, although they may have been present at the battle of Beth-Zachariah in 162. 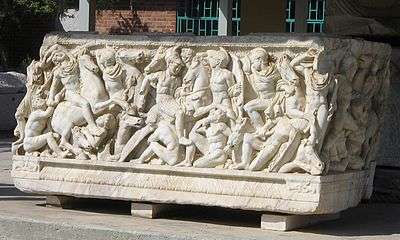 Leukaspides are mentioned in the army of Pyrrhus of Epirus on his campaigns in Italy. Under Cleomenes III, the Spartan army was reformed in 228 BC. Until then, the Spartans had merely kept the traditional hoplite spear. Cleomenes created a 4,000 strong phalanx and then formed another phalanx with 2,000 freed helots in order to counter the Antigonid Leukaspides. Philopoemen reformed the army of the Achaean League into the Macedonian phalanx in 208–207 BC and we are told that, by the end of the 3rd century, the Boeotians did the same, thereby creating the 'Peltophoroi'. New troop types, such as the Thureophoroi and the Thorakitai, were developed. They used the Celtic Thureos shield, of an oval shape that was similar to the shields of the Romans, but flatter. The Thureophoroi were armed with a long thrusting spear, a short sword and, if needed, javelins. While the Thorakitai were similar to the Thureophoroi, they were more heavily armoured, as their name implies, usually wearing a mail shirt. These troops were used as a link between the light infantry and the phalanx, a form of medium infantry to bridge the gaps. Numerous armies used this form of troop, for example the Achaean League's armies before Philopoemen. By the end of the 3rd century BC, the 'Macedonian' phalanx had become the dominant fighting style even for states such as Sparta . However, there are numerous aspects of the Roman army that were not carried into the Ptolemaic and Seleucid ones. For example, the differentiation of the Hastati, Principes and Triarii, or the integration of light-armed troops into the infantry structure. Hence, because of this, there was no Hellenistic equivalent to the Cohort. Instead, there was a system of larger units that had no relation to Roman organization. In terms of equipment, most of these so-called 'Romanized' troops did not abandon their traditional spear for a sword, which the Hasati and Principles abandoned between the 3rd and 2nd Century BC. Also the Romans used the pila, while Greek troops tended to use local variations of Javelins. Also similarity of equipment in regards to helmets and chain-mail can be explained by Celtic influence experienced by both the Greeks and Romans at a similar time. In this sense, we can only assume that the Hellenistic kingdoms did reform and re-organize their troops in some regards along Roman lines, but these appear to be superficial at best and quite possibly the result of convergent evolution, with both cultures influencing each other. Although, throughout the Hellenistic era, more importance was usually given to the role of the infantry than to cavalry, most major battles of the era were gained because of good or bad cavalry performance. Antigonus was defeated at Ipsus, because his victorious cavalry failed to return from the pursuit before the 400 enemy elephants effectively blocked its way back. Antiochus was defeated at Raphia, when, engaging in pursue of the defeated enemy cavalry, he failed to return and charge the enemy phalanx. At Cynoscephalae, the Aetolian cavalry played a key role in the battle and at Pydna, the Macedonian lancers suddenly left the battlefield allowing the Romans to surround and massacre Perseus' phalanx. At Magnesia, the cataphracts routed the Roman legions but it was Eumenes' cavalry that turned the tide and effectively ensured victory for the Romans. In Sellasia, it was Philopoemen's cavalry that conquered Oida, earning the admiration of Antigonus Doson. ↑ Mommsen, Theodor (1903). The History of Rome, Book III: From the union of Italy to the subjugation of Carthage and the Greek states. The History of Rome. ISBN 0-415-14953-3.